This package includes MasteringBiology™ . Build a flexible non-majors biology course with science literacy at its core. 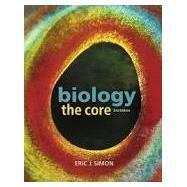 Eric Simon’s Biology: The Core combines a succinct, beautifully illustrated 12-chapter textbook with engaging MasteringBiology assignment options and extensive instructor support materials. The Core delivers a uniquely flexible teaching and learning package that supports Active Learning or “Flipped Classroom” teaching techniques, and an emphasis on current issues that relate to basic biological concepts. The modular organization of the text makes it easy for instructors to teach concepts in their preferred order, and powerful online assignment options reinforce those concepts by clarifying the “big picture” and preparing your students with the biological literacy skills required to make informed decisions outside the classroom. The Second Edition text and MasteringBiology assignment options further revolutionize teaching in and out of the classroom with a greater emphasis on the nature of science and dozens of new opportunities for students to practice basic science literacy skills. The Core’s concise modules continue to focus students’ attention on the most important concepts, combining dynamic figures and illustrations with supporting narrative as the primary source of instruction to create a more engaging and accessible learning experience for students. The new edition has been revised to strengthen the ways the text, MasteringBiology, and the instructor support materials work together in meeting the needs of both instructors and students—before, during, and after class. MasteringBiology is the leading online homework, tutorial, and assessment system, designed to improve results by helping students quickly master concepts. Students benefit from opportunities to practice basic science literacy skills, using interactive resources that create engaging learning experiences. Effective activities in MasteringBiology help students further visualize and understand complex biological processes. Comprehensive instructor tools include MasteringBiology assignment options. Eric J. Simon is an associate professor in the Department of Biology and Health Science at New England College in Henniker, New Hampshire. He teaches introductory biology to science majors and non-science majors, as well as upper-level courses in genetics, microbiology, tropical marine biology, and molecular biology. Dr. Simon received a B.A. in biology and computer science and an M.A. in biology from Wesleyan University and a Ph.D. in biochemistry from Harvard University. His research focuses on innovative ways to use technology to improve teaching and learning in the science classroom, particularly for non-science majors. Dr. Simon is the lead author of Campbell Essential Biology and Campbell Essential Biology with Physiology as well as coauthor of Campbell Concepts and Connections.